On Thursday, August 9, PBA Galleries holds a 613-lot sale comprising Fine & Rare Books (lots 1-184); Books in Early Jackets - The Bret Sharp Collection (lots 185-385); Art & Illustration, Children's Books (lots 386-457); Asian & Asian-American Art & Illustration (lots 458-534); the final section (lots 535-613) are being sold without reserve. Osvald Sirén's four-volume work Chinese Sculpture from the Fifth to the Fourteenth Century (1925) is estimated at $10,000-15,000. An interesting copy of Leaves of Grass, believed to be an undated printing issued in 1896 with an unrecorded publisher's dust jacket, could fetch $7,000-10,000. At the same estimate is an 1819 topographical and statistical account of Nuremberg, Neues Taschenbuch Von Nürnberg in original dust-jackets and cardboard slipcases. A very rare copy of the "joint-stock novel" An Object of Pity, created by Robert Louis Stevenson, his family members, and visitors in Samoa in 1892 and privately printed at Sydney (but with a false Amsterdam imprint), is estimated at $5,000-8,000. This copy is from the Stevenson family library, and contains a list of the authors and notations by Stevenson's stepson and collaborator Lloyd Osbourne. The bookplate is signed by Stevenson's stepdaughter, Isobel Osbourne Strong. Also included is the response, Objects of Pity, written by Mr. Haggard, the British Land Commissioner and the "hero" of the original work. 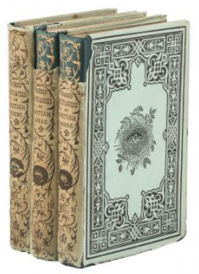 An early printing of F. O. Morris's A Natural History of the Nests and Eggs of British Birds, published in 1864 and featuring early plates by Arthur Rackham, very scarce in the printed jackets, could sell for $4,000-6,000 (pictured). Also among the lots are a collection of printed invoices and receipts to bookbinder William J. Roy of Lancaster, Pennsylvania from around 1897-1908 ($300-500); a first edition of Rachel Carson's Silent Spring ($300-500).